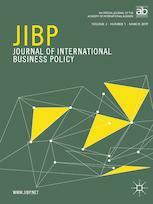 The Journal of International Business Policy (JIBP) is the principal outlet for theoretical and empirical research in all areas of policy that relate to international business. Papers are evaluated based on their innovativeness, academic rigor, and policy relevance. All papers should aim to improve the knowledge necessary for designing, implementing, and sustaining effective international business policies. JIBP welcomes submissions that contribute to our understanding of international business policy in any of the following five policy areas: 1. international business promotion 2. foreign business attraction 3. industrial policy 4. social and development policy and 5. transnational governance.